Organize or gather your products and display it as a collection in a grid or slider view for more user engadgement. The newer way to display related products togather. User can view collection products in a stand alone page with your theme inherited layout. Display collcetion in a grid view. Display collcetion in a slider view. Display collection products in a stand alone page with theme inherited layout. Set custom link on a collection. Set collection height via shortcode. Display collection products in your desired order with easy Drag & Drop feature. Easy Drag & Drop features for collection products. Display collection with title and description. Display number of products in a collection. Display your desired image in a collectio rather then product featured image. 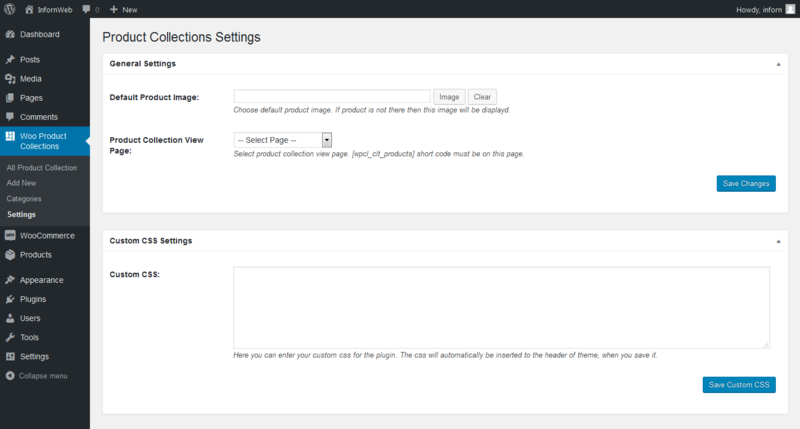 Plugin setting page with default product image and collection view page. Custom CSS options via plugin settings. Slider various parameters like autoplay, speed, looping, slider arrows and etc. Set collection "Order" and "Orderby" sorting parameters via shortcode. 100% multilanguage - Woo Product Collections is completely translatable both in front and back-end. Plugin settings page holds various settings. These are the global plugin settings. Some settings can be overwritten from the post meta settings. Choose default product image. If product image is not there then this image will be displayd. Select product collection view page. When user clicks on the collection, they can see the collection products on this page. You can provide the custom link on a collection via 'Product Collection Settings' from collection meta settings. Note: [wpcl_clt_products] short code must be on this page. Here you can enter your custom css for the plugin. The css will automatically be inserted to the header of theme, when you save it. Provide custom collection link and choose collection products. Enter custom collection link. Leave empty for default link. Search & Choose collection products with ajax load more functionality. You can drag & drop products to desired order. There are two shortcode which you can use to setup the collection into any page or post at any position. Note: Please enter the shortcode into 'Text' tab of WordPress plugin editor without 'code' HTML tag. The number of collections you want to show. Default limit="10". To show all collections you can set limit="-1"
Controls the number of columns for collection. You can set grid upto 4. Controls the collection height as you want. Controls the product count text. Where %total% will be replaced with the number of products. Controls the link behaviour of collection wheather to open in a new page or in a same page. Values are "self" OR "new_tab". Display the collection title. Values are "true" OR "false"
Display the collection description. Values are "true" OR "false"
Display the number of words for collection. Note: If you had written "Excerpts" for collection then it will be displayed else post description will be displayed. You can enter continue reading text. e.g Three dots as a continue reading. Enable the masonry layout for the collection. Set order of your collection. Values are "DESC" OR "ASC". You can display collection category wise. Pass the category id for which you want to display the collection. You can pass multiple category ids with comma seperated. If you are displaying the parent category collection then you can controll child category collection. Values are "true" OR "false"
Display specific collection which you want to display. You can pass multiple ids with comma seperated. Exclude specific collection. You can pass multiple ids with comma seperated. Controls the number of columns for collection. Number of slides slide at a time. Run slider contineously. Values are "true" OR "false"
Display slider pagination dots or not. Values are "true" OR "false"
Display slider arrows. Values are "true" OR "false"
Run the slider automatically. Values are "true" OR "false"
The number of products you want to show then pagination will come. Default limit="10". To show all collections you can set limit="-1"
Display pagination or not. Values are "true" OR "false"
Set sort order of your collection. Values are "date" (Published Date), "modified" (Updated Date), "title" (Title), "menu_order" (Sort Order), "ID", "rand" (Random), "post_in"
Set previous product text of pagination. Default value is ← "←"
Set next product text of pagination. Default value is → "→"
The Woo Product Collections is made with WordPress standard and it is developer friendly. The plugin contains some markup files within the /templates/ directory.